Welcome Irene to EC Vancouver! My name is Irene. I’m from Spain, from a small region called La Rioja which is very famous for its wine. If you are going to visit Spain someday, you must go to La Rioja, you are going love it. I’m 25 years old. I’m studying two degrees at the same time, one in the morning and one in the afternoon. The first one is Audiovisual Communication and the other is Socio-cultural Coordinator. In my free time I like to listen to music and go to the movies. I’m going to stay in Vancouver for 3 months. I’m here as a student, but also as a practicant. I applied for a co-op program in the school. 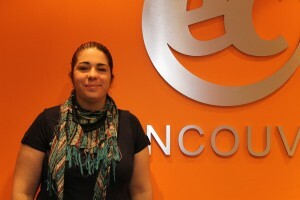 I’m here to help all the staff of EC Vancouver and to study English at the same time. I’m also writing a blog about my experiences in Vancouver and to guide other Spanish people who want to come to Vancouver to study, so feel free to take a look if you want. This summer, I am expecting to improve my English while having new experiences in a different country. It’s a great opportunity for me to learn about a new country and its culture. It’s also a new challenge for me. You can find me in the front desk next to Michelle and Alejandra, so came to say hello wherever you want.